Among various efficient electrocatalysts for water splitting, CoFe and NiFe-based oxides/hydroxides are typically promising candidates thanks to their extraordinary activities towards oxygen evolution reaction (OER). However, the endeavor to advance their performance towards overall water splitting has been largely impeded by the limited activities for hydrogen evolution reaction (HER). Herein, we present a CoFeNi ternary metal-based oxide (CoFeNi-O) with impressive hierarchical bimodal channel nanostructures, which was synthesized via a facile one-step dealloying strategy. The oxide shows superior catalytic activities towards both HER and OER in alkaline solution due to the alloying effect and the intrinsic hierarchical porous structure. CoFeNi-O loaded on glass carbon electrodes only requires the overpotentials as low as 230 and 278 mV to achieve the OER current densities of 10 and 100 mA·cm−2, respectively. 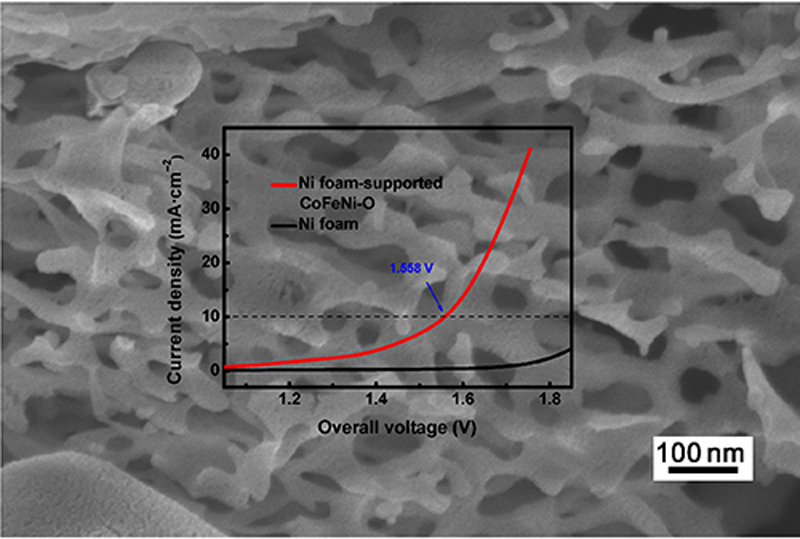 In particular, extremely low overpotentials of 200 and 57.9 mV are sufficient enough for Ni foam-supported CoFeNi-O to drive the current density of 10 mA·cm−2 towards OER and HER respectively, which is comparable with or even better than the already-developed state-of-the-art non-noble metal oxide based catalysts. Benefiting from the bifunctionalities of CoFeNi-O, an alkaline electrolyzer constructed by the Ni foam-supported CoFeNi-O electrodes as both the anode and the cathode can deliver a current density of 10 mA·cm−2 at a fairly low cell-voltage of 1.558 V. In view of its electrocatalytic merits together with the facile and cost-effective dealloying route, CoFeNi-O is envisioned as a promising catalyst for future production of sustainable energy resources. Supplementary material is available for this article at https://doi.org/10.1007/s12274-019-2389-5 and is accessible for authorized users. 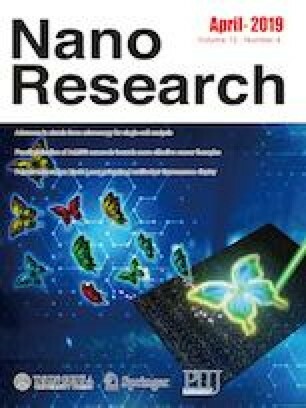 The authors gratefully acknowledge financial support from the National Natural Science Foundation of China (Nos. 51871133 and 51671115), Department of Education of Jilin Province (No. JJKH20190767KJ), and Department of Science and Technology of Shandong Province for Young Tip-top Talent Support Project.